I'm running through my Infinite Skills Advanced Carrara Techniques again. It's Phil's turn in the order of my TV selection. I must say... I put it on in the first place because I have great memories of the set being intensely entertaining in a very Carrara sort of way. An overly positive person like me lends well to having an instructor who is very cofident in his skills and the tools he uses to make it happen. This series is all about making your own gear... your own content to animate and render. I got to chapter four where he's now going through the process of building a really awesome airplane (the one on the cover) using images in the vertex modeller to help shape the thing... and explains how cool it is that the construction in Carrara is similar to the way the real planes are made, in a way, right at a time when the same thought comes to mind! It's too cool.From my memory, I know that I can't take my seat belt off yet, because there's so much nore to come. He also enters the other modelers for certain things just so that he can show you those tools, and he's already taught you so many cool techniques in the vertex modeler that you could easily make them using the vertex modeler yourself by that point. His style is such that none of the time in the training is wasted on non related jibber jabber or redundant repetition. And he's entertaining on top of it. That's talent. It takes quite some time to get through all of the lessons. If you already know Carrara a lot, you'll love what you hear as I'm sure you'll pick up on some excellent new advice and tactics towards executing certain posibilities. If your new to any of the subjects covered, you'll really learn a lot each time you go through the course. To really learn Carrara's modeling room tools, following through and working with Phil, following his lead, you'll realize what can be done and acquire a feel for how to use the required finesse to create nice models using many different techniques, mny of which can replace each other. What I mean by that is that.. if he makes this part using this method, he'll have you make the next part using another new technique or tool which both avoids redundency, and demonstrates to you mouse hand andquick keys how it feels to build in another way - so when you model on your own, you'll know which ways feel better for your style of taste and dexterity. He also goes through a really thorough analysis through the PITA process of UV Mapping and unwrapping, which is very important and will make the difference between something really good, and something that is... not. So it's good how he makes you revisit the UV Mapping for every different thing that will require a different method for a good map result. It's really a perfect flow. Finally thers a single, short overview of "Who is Phil Wilkes" as the very last video that you see. Bought it the first day of the sale! when I saw 40% off tutorials, man, I went looking for it! I'm not ready for it yet but glad I have it when I am! Don't kid yourself. Unless you mean "time" as opposed to "skills" by "not ready for it yet." Phil's style will ease you into even the advanced stuff gently. It really is some of the best training out there -- and for Carrara, it sets the bar high. Those training items are so worth the money not just because they are good but they will help you learn Cararra so much faster than on your own and more importantly will get you to love Cararra even more as you see how much more you can now do. You could tell, he's have rather done it the other way... but I was glad to see that, in this situation, Booleans didn't make a big mess of his really nice model! Just came to me because what he did later on, is to explain that there are several methods we could use to make the ailerons move up and down - and talked for a bit about the advantages and disadvantages to these various methods, and what the best approach for each would be. But instead, Fenric made this cool plugin, the ERC controller for Carrara - so let's use that! I forgot that he did that! The ERC is an incredibly powerful animation setup plugin that I bought as soon as my financial situation would allow... same with this training course. The ERC is no simple set of actions to explain in a read me. One day when I understand it better, I'll write up an instruction manual for Fenric to distribute to all ERC users. But what Phil uses it for in this demonstration makes good use of part of it, and gives a beautiful, and fairly short explanation of how to make it work for having the rotation of one aileron control the movements of the other three, plus the cables that keep the ailerons aligned in a real plane. That's three individual types of ERC setup explained and demystified right there. That alone is worth the full price of this training course - and it's a tiny fraction of what you learn. As I said, he doesn't dwell on the ERC. I think he knew that some people don't have it - so we need to get in and out. Which is what he did - but in the process explained clearly and concisely what needed to be setup, and how. Very, Very cool! I really like how he created a whole Carrara-Made scene to render his beautiful Biplane model in. It's a gorgeous scene with trees in the background and grass on the ground... knowing that he'll be teaching these techniques later in the course, he just briefly shows what he made and why, and a quick explanation of how, while assuring the student that this will be covered in great detail in a later chapter (which it is... and the detail is great), but he includes this scene, with the plane for you to keep in the working files anyways. How freaking sweet is that?!!!! It's an amazing resource for learning, as well as a great set of additional content that you can simply add to your browser. I've done exactly that with all of his dynamic hair stuff. But I'm going to add a lot more - including this cool Biplane! What I meant by it not being time yet was that I want to finish the first dvd before I dive into the second. I love these videos! I'm putting his videos on my wishlist. I've heard too many great things - on many other posts too - to not dive into some great training. You are all a great resource for questions but, I also think we should teach ourselves to fish, so to speak. Thanks for the reminder about Phil's videos. First of all, sorry for reviving this thread, but I think this is the best way to keep the forums relatively clean. I just bought this packet with the 40% off and $10 extra savings (which I thought is a good deal), just to find out that it actually isn't meant for carrara 8.5. The text-file in the product library suggest it is for carrara 7. My bad for not checking thoroughly before buying. How much of use is this for the 8.5 version. Does it miss too much about the new functionality to be of any use? by the way, I did not buy the 8.5 beginners tuttorials. I saw a part of that already (the free content). Will that one complement with the Advanced Carrara Techniques enough or should I try to get a refund and wait till Advanced Carrara 8.5 Techniques will come out (if it ever will). What is contained in the Advanced Carrara Techniques is very relevant for 8.5 users. The 8.5 upgrade had little to do in this department - but was geared specifically towards making compatibility with the new Genesis technology within Carrara. I use 8.5 and love learning from this video set. I'm not sure what you're seeing for Carrara 7, as this was made for 8. I would add more PhilW rather than replace anything. But that's just me. From what I remember, aside from additions to the lights and stuff, I think the interface for the modelers stayed the same. Thank you for cprrecting and clarifying. 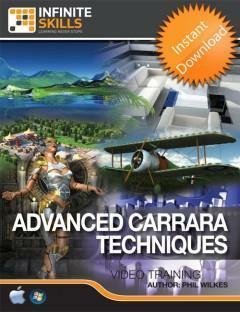 In the product library there was the file "Carrara7TrainingInfo.txt", and since the video's were released on 2011-06-01, I thought that it could totally make sense that it was made for 7. Having seen some video's, I will follow your advise to add more Phil Wilkes videos. He is really good at teaching to the point. Much better than youtube tutorials which generally really suffer from chaotic guidance. I don't like buying tutotials, but this this is really worth the money. I could not have learnt Carrara without Phil's training. Recommend all those new to Carrara check them out. Like scottidog2, I would recommended to any new or even experience user. Add me to the PhilW fanclub. A great thing about PhilW's tutorials is that he shows the tools in the context of a variety of projects. I still find myself reviewing a specific PhilW section when I start a project similar to that section. This includes material from his beginner's tutorials. Even experienced 3D and Carrara users will get a lot more for their Carrara money if they watch PhilW's tutorials.